We have dedicated quite a bit of space this blog critiquing art inside the Minnesota State Capitol, adding only a few passing posts on the outdoor monuments. It was a pragmatic choice. The state-appointed Art Subcommittee has driven the debate around Capitol art, and it’s focused on art inside the Capitol. Its recommendations will not include outdoor statues. Now comes a story from Minnesota Public Radio headlined: Time takes toll on historical markers at Capitol, which reminds us of the roughly two dozen memorials and markers on the Capitol grounds. Two of the more controversial monuments honor Christopher Columbus (Idle No More Twin Cities has called for its removal) and the statue to former Minnesota Governor, U.S. Representative and Senator Knute Nelson (a key player in federal policies that stripped Ojibwe people of land and resources). Both statues have prominent locations: Columbus on the Capitol’s east lawn and Nelson on the Capitol’s front steps. I’ve walked up and down the Minnesota State Capitol steps hundreds of times as a state employee, reporter, and visitor. I had some vague awareness of the statue there honoring some 19th Century leader, but I never really paid attention. I am paying attention now. Fast forward to Friday. I had the pleasure of attending a fundraising breakfast for The Circle newspaper at All Nations Church. Winona LaDuke was the keynote speaker. I spoke to her briefly after the event, talking about some of the controversy around art in the Capitol and Healing Minnesota Stories’ work in this area. She was most fired up about the Knute Nelson statue, honoring a man who stole Ojibwe land. I was taken aback. Knute’s statue was not on my radar. Healing Minnesota Stories doesn’t include Knute’s statue in our presentation. Now I had read about “The Nelson Act” but I had never put two and two together, that the Nelson of the Nelson Act was the guy on the pedestal in front of the state Capitol. I am sure you could stop people on the Capitol steps and few if any could identify Knute Nelson and fewer would know what he did. Here’s the story of the man with one of the most prominent statue sites at our state Capitol. Knute Nelson was a U.S. Representative, Senator and Governor for Minnesota. He is the namesake of the Nelson Act: “An act for the relief and civilization of the Chippewa Indians in the State of Minnesota.” It passed January 24, 1889. [The Nelson Act was intended] to relocate all the Anishinaabe [Chippewa] people in Minnesota to the White Earth Indian Reservation in the western part of the state, and to expropriate the vacated reservations for sale to European Americans. … These actions were illegal and violated the treaties which the US had made with the tribes, but the government proceeded anyway. Like the federal Dawes Act passed two years earlier, the Nelson Act divided communally-owned tribal lands into individual plots for Chippewa households. The process, called “allotment,” was to encourage subsistence farming and assimilation. Perhaps most importantly, allotment made it easier for European settlers to buy Indian-owned property. The Nelson Act passed just seven years after the Dakota-U.S. War of 1862. While the Ojibwe had nothing to do with the 1862 war, Minnesota white residents wanted to reduce Indian-controlled lands and push them west. Some Ojibwe didn’t relocate to White Earth. For instance, the Rad Lake band was able to keep the southern portion of its reservation next to the lake. The Sandy Lake Band in Aitkin County was not so lucky. Members had stayed neutral in the 1862 war, but Wikiepdia says they still were pressured to move. Some did stay in Sandy Lake with their individual land allotments, but they were in the minority now. “[F]orced land-sales illegally erased the Reservation off the maps,” Wikipedia said. A couple of questions arise. 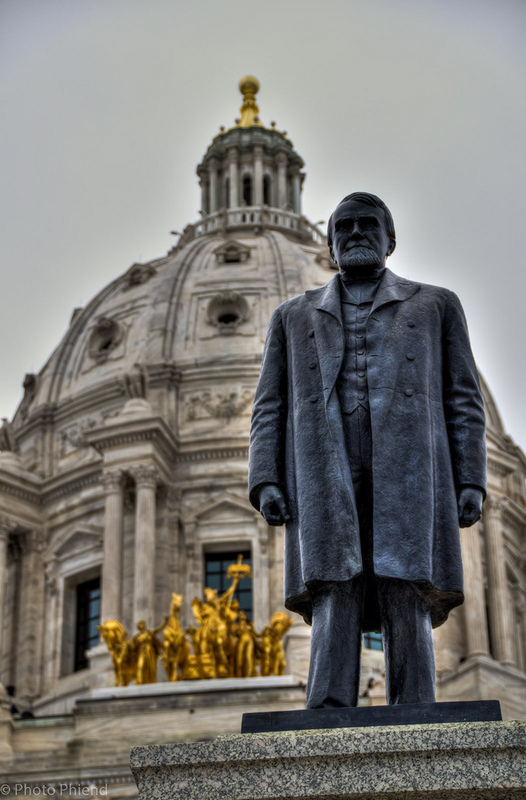 One: Why do we still have this massive statue to Knute Nelson on the front steps of the Capitol when for all practical purposes, no one knows who he is or what he did? Two: Let’s say we did a really good job of interpreting this statue and telling this story, would this still be a man we would want to honor with such an important space? Three: How can we still tell this important part of Minnesota history without giving the impression that we think these were honorable acts? Could the statue be moved to another location? My theory: While almost no one could identify Knute, any effort to de-Knute the Capitol steps would raise an uproar. Still, my vote is to move the statue and find new more inspiring and inviting art for the Capitol’s front door. Like the Nelson Act which ignored treaty rights and taking Indian land, the Cherokee Removal Census is part of a larger story of the government ignoring the law and taking Indian land — this time, on a national level. During the fall of 1835, the Superintendent of Cherokee Removal, Benjamin F. Curry, appointed officials to count all Cherokees residing in Georgia, North Carolina, Tennessee and Alabama–their historic homelands. The Census would determine the number of Indians and value of their property in preparing for their removal. The final census, submitted on this day in history, December 12, 1835, is contained in a large, leather-bound volume, 66 pages long. It is chilling to think of such an official document, carrying out an unconstitutional act, having people “removed,” and in many cases, killed in the process. The Census listed 16,542 Cherokees and 201 intermarried whites. They owned 1,592 black slaves. The Census was taken in advance of the Treaty of New Echota, “negotiated and signed by a small faction of Cherokee tribal members, not the tribal leadership,” according to Wikipedia.